I’ve been cruising around the net incessantly for years now this week and have come across a few wonderful recipes which I thought I’d share. Besides, I want to be able to find them again myself, they’re definitely keepers. Firstly there was the ridiculously quick and easy to prepare cheeseburger pie. This one has the lot. Speed, ease, budget friendly, kid appeal, comfort food. It’s gold. I was momentarily frightened by the mention of ‘Bisquick’ but that was easily overcome. Of course the bisquick substitute required a small substitution of it’s own because I don’t think we have crisco in Australia and I don’t do vegetable shortening anyway. Butter worked just fine. My next find was lunch today. 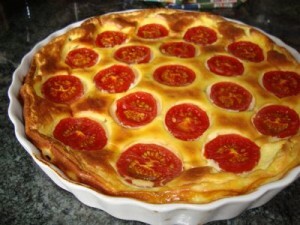 A light but filling ricotta, tomato and basil torte. Another very quick to prepare meal. Pretty too. It made a lovely lunch with a green salad on the side and would serve just as well for dinner. Lastly, the chocolate malt biscuits. I omitted the sultanas as I think this style of biscuit spreads to thinly during cooking to hold a sultana well. I also substituted the sugar for muscovado and reduced the amount to 1/2 cup. Be warned. These are terribly moreish. Terribly. Don’t say I didn’t warn you.